One problem solved? Perhaps, but there are always others waiting in line. 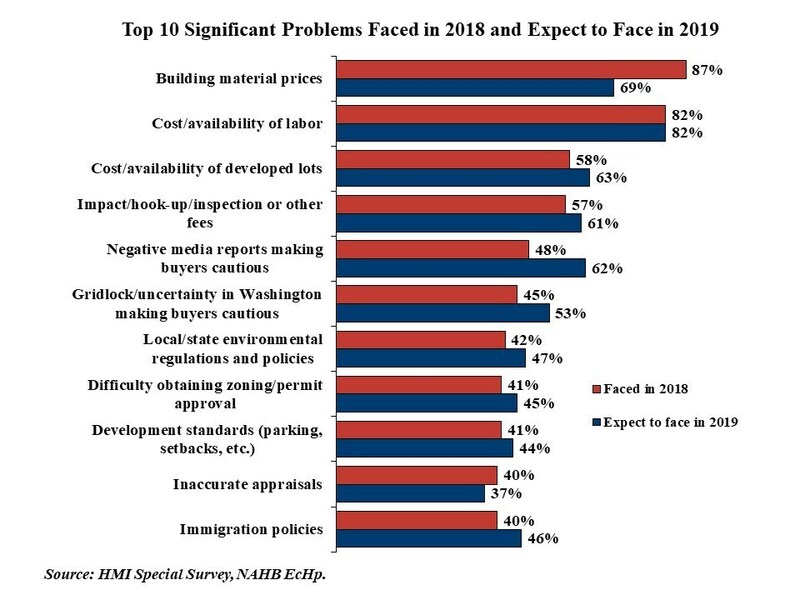 The National Association of Home Builders (NAHB) asks its new home builder members annually, as part of its January NAHB/Wells Fargo Housing Market Index survey, to name what they expect to be their top business problems in the coming year. In 2018 the cost of materials led the list, followed by issues regarding labor. Eighty-seven percent of respondents in the 2018 survey cited materials while 82 percent named the cost and availability of labor. This year the former problem sank to a potential issue for 69 percent, and 82 percent still cited labor shortages, returning it to its pre-2018 position as the most widespread challenge facing builders. That still leaves materials in second place and the importance of other problems, such as cost and availability of lots and the impact of fees, have increased. Surprisingly, the biggest increase, from a mention by 47 percent of builders in 2018 to 62 percent this year, was negative media reports about housing. Builder cited this as increasing buyer unease. 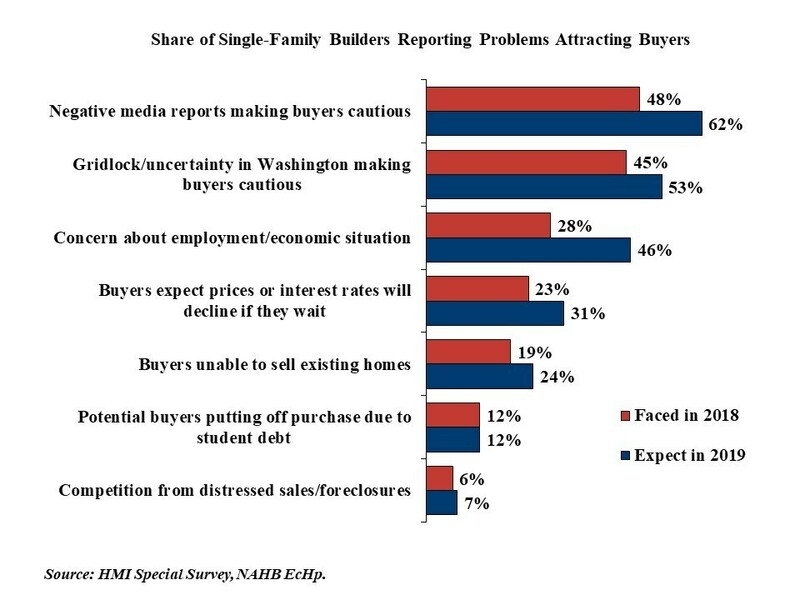 In fact, as Ashok Chaluvadi writes in NAHB's Eye on Housing blog, problems that he classified as supply side attracted the most mention in 2018 while those he classified as problems attracting buyers, such as the negative media reports issue, are viewed more frequently as potential issues for 2019. Problems ebb and flow in the builders' world. For example, only 13 percent cited labor as a significant problem in 2011 but it jumped to 30 percent the next year and has risen steadily ever since. Now interest rates are growing as a concern. 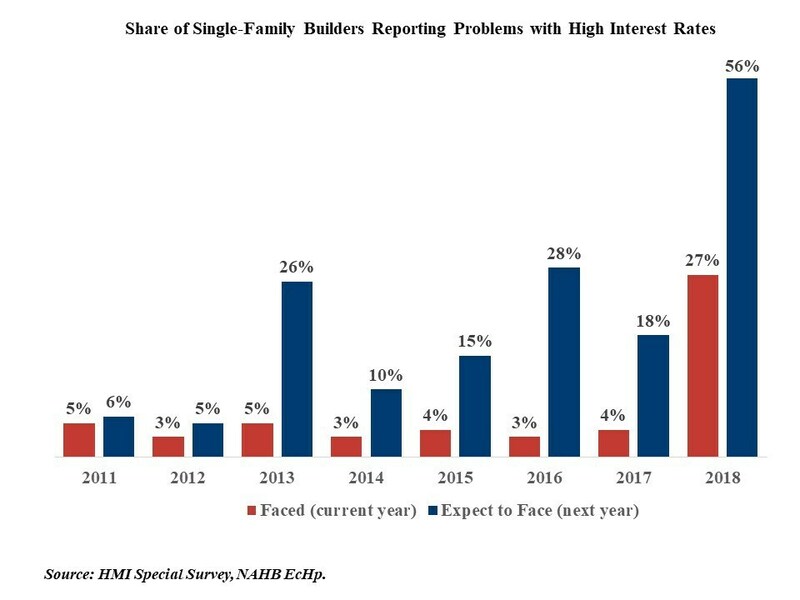 The 56% of builders who expect high interest rates to be a problem in 2019 is up strongly from the 27% who said it was a problem in 2018, and both numbers were much higher in 2019 than at any time in the 2011-2017 span.